Olympian Mary Whipple at K1 Speed Seattle! Mary Whipple (bottom right) conducts a coxswain (rowing) leadership camp at the University of Washington for high school coxswains. 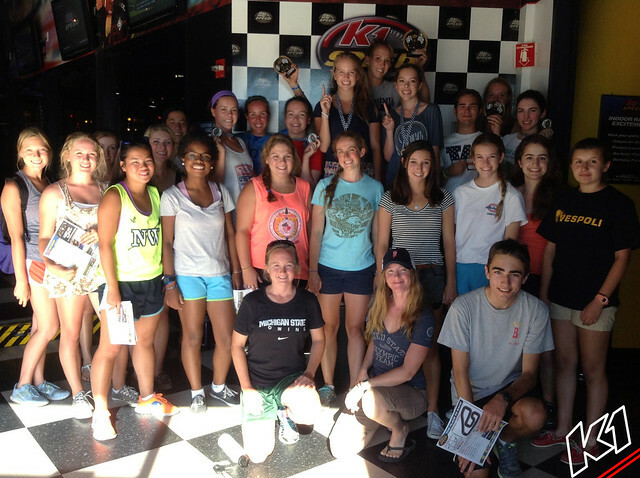 Mary brings the group into K1 Speed Seattle to teach them about how to race smoothly and how to anticipate lines. Mary Whipple is an American coxswain. She competed at the 2012 Summer Olympics and at the 2008 Summer Olympics. She won a gold medal in women’s eight at both competitions. She also competed at the 2004 Summer Olympics where she won a silver medal. As a coxswain, Whipple stands 5’3″ and weighs in at 108 lbs. As a freshman at the University of Washington, Mary coxed the women’s varsity four to a national title in 1999. She coxed the varsity eight to victory at the Royal Henley Regatta in 2000, taking home the first-ever Henley Prize, while also coxing them to a silver medal in the NCAA championships as part of a second place finish in the team standings that year. In 2001 and 2002, Mary coxed the varsity eight to back-to-back NCAA championships, and the Huskies also took home the team title in 2001. Mary has an identical twin sister Sarah Jeanine Whipple. Sarah is an assistant coach for Women’s Crew at the University of California at Berkeley.